Pilots who believe that aerobatic training will enable a recovery from an inadvertent spin in the traffic pattern are fooling themselves. That myth - and other misconceptions about stalls and spins in GA aircraft - is exploded in this new ASF study. This study is not intended to discount the value of properly conducted aerobatic and spin training. Training in a controlled environment with a trained instructor is beneficial. The most important aspect of the training should be recognition and prevention. Stall/spin accidents tend to be more deadly than other types of GA accidents, accounting for about 10 percent of all accidents, but 13.7 percent of fatal accidents. Overall, around 20 percent of all GA accidents result in fatalities, but stall/spin accidents have a fatality rate of about 28 percent. This study looked at 450 fatal stall/spin accidents from 1993 to 2001 involving fixed wing aircraft weighing less than 12,500 pounds. 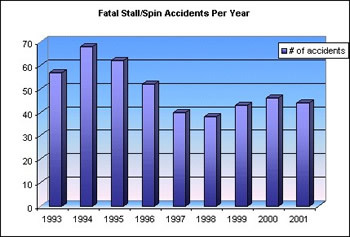 Stall/spin crashes accounted for 10% of all accidents and 13.7% of all fatal accidents. Why the constant reference to "stalls/spins" instead of separating the two manoeuvres? A spin is an aggravated stall but the aircraft behaviour, recovery procedure, and the altitude loss is quite different between stalls and spins. However, many accident reports conclude that the cause of an accident was a result of an 'inadvertent stall/spin' with no additional clarification. Because most light GA aircraft do not have flight data recorders, and there may be no reliable witnesses, it is often impossible for the investigator to precisely determine the aircraft's flight condition prior to impact. 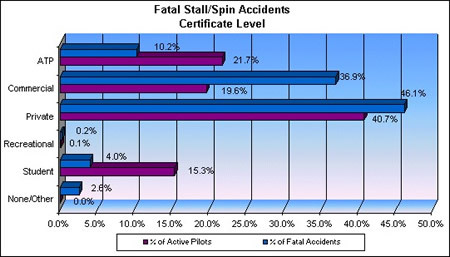 These accidents are more likely to be fatal (on average, 28 percent of stall/spin accidents are fatal compared to other types of GA accidents (20 percent with fatalities). 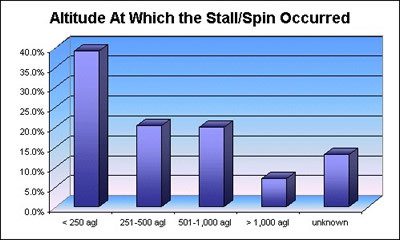 The higher likelihood of fatalities in stall/spin accidents is due largely to crash dynamics. If an aircraft strikes the ground in a normal landing attitude and can dissipate the crash energy over even as little as 100 feet the chances of fatality, assuming no fire, decrease significantly. However, if the impact occurs nose down, at a high rate of descent which is typical of stall/spin scenarios, the G forces tend to be much higher, the aircraft does not slide much and there are resulting fatalities. 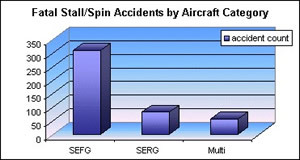 Single engine fixed gear (SEFG) aircraft are the types most often involved in stall/spin accidents, by a wide margin. Pilots of such aircraft don't necessarily need to be alarmed, however; the high number of stall/spin accidents in SEFG has less to do with the aircraft type than the fact that SEFG aircraft are frequently used in training and are likely to spend more time in manoeuvring flight and the traffic pattern. Cross-country aircraft, such as single engine retractable gear aircraft (SERG) and twins (Multi) are less likely to be involved in this type of accident. Student pilots are, by far, the least likely to suffer stall/spin accidents, as a proportion of in the pilot population. Pilots holding FAA Airline Transport Pilot (ATP) certificates are also less likely to stall/spin. That leaves pilots with FAA private and commercial pilot certificates in the "most likely to suffer fatal stall/spin accidents" category. In fact, commercial pilot certificate holders are by far most likely to show up in the stall/spin accident statistics, again based on the proportion of their representation in the pilot population. (See chart). So why do the least experienced and most experienced pilots enjoy the best safety record, at least when it comes to fatal stall/spin accidents, while the rest of us - the bulk of GA pilots - do so poorly? Based on the number of certificates issued, it appears that ATPs are generally the most experienced and knowledgeable pilots, while students are under very close supervision to ensure their safety. Some commercial and private pilots, on the other hand, may have grown complacent in their skills, or lack proficiency or understanding in aircraft operations at the corner of the flight envelope. It may also be that a little knowledge is a dangerous thing. Student pilots aren't usually very far into the private pilot curriculum before stall training is started. (Spins were deleted from the requirements for a private pilot certificate in June 1949, and the accident rate from spins has been decreasing ever since. This doesn't mean that you shouldn't receive spin training but understand that if an inadvertent spin occurs at low altitude, recovery is unlikely, even with training. Until 1949, private pilot applicants were required to demonstrate spins, so spin training was a routine part of the private pilot curriculum. In June of that year, the CAA (predecessor of today's FAA) removed the requirement for spin training for private pilots, substituting increased training in stall recognition and recovery, since spins cannot occur without a stall. (A requirement for instructional proficiency in spins remains today only for flight instructor candidates). Officials at the time also reasoned that if there was no spin requirement for private pilots, then aircraft manufacturers would also be encouraged to produce aircraft with greater spin-resistant characteristics. Removal of a spin requirement for private pilots created much dissent on the part of instructors and other aviation professionals, who forecast an immediate and dramatic rise in the number of spin accidents. It didn't happen. In fact, since elimination of the spin requirement for private pilots, the incidence of stall/spin accidents has actually decreased substantially. Following the U.S. lead, Canada and the United Kingdom dropped spin demonstrations for non-CFI check rides for the same reasons. 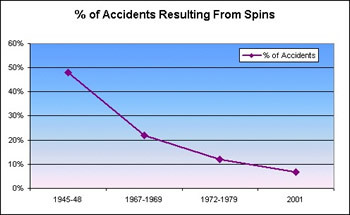 Although the total number of stall/spin accidents has dropped dramatically since 1949, those that do still occur tend to occur at fairly low altitudes. In fact, a 2001 ASF study on 465 fatal stall/spin accidents that occurred from 1991 through 2000 showed that at least 80 percent (and probably more) of the accidents started from an altitude of less 1000 feet agl, the usual traffic pattern altitude. The study found that only 7.1 percent of the aircraft involved in the stall/spin accidents definitely started the stall/spin from an altitude of greater than 1,000 feet agl. Just over 13 percent of the aircraft were reported at an "unknown" altitude at the beginning of the accident, and so were given the benefit of the doubt by ASF. Another study done earlier by the FAA Small Aircraft Directorate, which included some 1,700 stall/spin accidents dating from 1973, concluded that 93 percent of such accidents started at or below pattern altitude (pattern altitude at many airports in the 1970's was often 800 feet agl, adding emphasis to the study findings). The altitude required for recovery from stalls is minimal compared to that required for recovery from spins, even when experienced aerobatic test pilots are on board and ready to recover from the spin. Pilot Operating Handbooks for various typical GA aircraft estimate average altitude loss during stalls, assuming proper recovery technique, as between 100 and 350 feet. In the Yankee, it took an average of 210 feet for entry, 340 feet for stopping the turn, and another 550 feet for recovery, for a total of 1100 feet. In the Arrow, the figures were 140 feet for entry, 400 feet for stopping the rotation, and 620 for recovery, for a total of 1160 feet. In short, the average vertical recovery distance was just short of 1200 feet. Pilots allowing a spin to develop at or below traffic pattern altitude are nearly certain to crash, no matter how quick their reflexes or skilful their recovery. 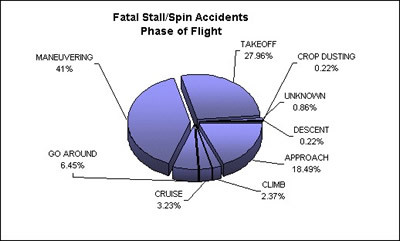 Fatal stall/spin accidents generally occur during manoeuvring flight (40.2%) or takeoff (28.8%). Manoeuvring flight is loosely defined, but usually includes any type of flight where a pilot is using the aircraft's flight controls to perform manoeuvres not necessary for straight-and-level flight. Many pilots commonly associate manoeuvring flight with unauthorized low-level flight such as "buzzing," but other types of manoeuvring flight might include low-level pipeline patrol, banner-towing, aerobatics, or even normal air work in the practice area. The NTSB defines manoeuvring flight to include all of the following: aerobatics, low passes, buzzing, pull ups, aerial application manoeuvres, turns to reverse direction (box canyon type manoeuvre), or engine failures after takeoff with the pilot trying to return to the runway. In reviewing 44 fatal stall/spin accidents from 1991 - 2000 and classified as instructional, ASF found that a shocking 91%(40) of them occurred during dual instruction, with only 9% (4) solo training flights. Of the fatal instructional accidents, 64.4% of them occurred during manoeuvring, and 17.8% of them occurred during takeoff. Obviously instructors must be proficient in stall recovery, and if not current in spins, prevent the aircraft from entering the spin regime. Many instructors have not practiced a spin recovery since receiving their spin endorsement, which may have been many years ago. On the other side of the cockpit, instructors should monitor students closely when they are practicing stalls. If the student inadvertently spins the aircraft, can they safely recover? According to the 2002 ASF Nall Report, takeoff accidents (including those that result in a stall/spin) are much more likely to be fatal than landing accidents. Aircraft design is the primary factor in how an aircraft will behave in a stall or spin. All aircraft must meet FAA certification standards for stalls and in some cases, spin recovery. Not all aircraft are approved for spins and may become unrecoverable if a spin is allowed to develop. The Piper PA-38 Tomahawk, designed specifically for flight instruction, including easier demonstration of spins, was involved in 50 stall/spin accidents from 1982 through 1990, for a rate of 3.28 per 100 aircraft in the fleet. 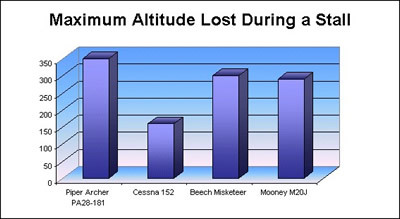 During the same period, the Cessna 150/152 had 259 stall/spin accidents, for a rate of 1.31 per 100 aircraft, and the Beech 77 suffered only four such accidents, for a rate of 1.64 per 100 aircraft. Tomahawks, therefore, were involved in roughly double the number of stall/spin accidents per 100 aircraft as the Cessna 150/152 or the Beech 77. These are raw numbers where the NTSB identified stall/spin as the primary causal factor. An estimated 43 of the Tomahawk accidents occurred at a low altitude, where recovery, regardless of aircraft type, was unlikely. In many cases, the stall was the final event where an accident was already all-but-certain, such as buzzing, fuel exhaustion, or strong surface winds. In some cases, it was not clear from the narrative how high the aircraft was when the stall or spin began. ASF was able to identify nine PA-38 accidents in which the NTSB cited spin as a cause or a factor. The NTSB also coded one Beech 77 and 59 Cessna 150/1 52 accidents as spin-related. The accident narrative indicated that the aircraft was spinning. Bottom line - the Tomahawk is involved in proportionately more stall/spin accidents than comparable aircraft. Regardless of aircraft type, in many cases a stall is only incidental to the accident. Considering fleet size and hours flown, spin performance of the Cessna 150/152 and the Piper PA-38 are worth comparing. Manufacturers of both recommend no fewer than 3,000 to 4,000 feet agl as a minimum altitude for recovery. Spin entry altitude recommendations range from 6,000 in the Cessnas to 6,500 to 7,000 feet in the Piper. When proper recovery techniques are used, the one-turn spin altitude loss for both the Cessna 150 and 152 is about 1,000 feet, taking between ¼ and ½ turn. For the PA-38, recovery may require up to 1-½ turns and between 1,000 to 1,500 feet. No matter what aircraft is flown, pilots must respect aerodynamics and operational differences. Especially in high-performance aircraft, techniques vary, but when flown properly, they pose no problems. Most of today's pilots have been taught that stalls occur when the angle of attack of the wing reaches a critical point. In the majority of GA single-engine aircraft, that critical AOA is around 16-18 degrees above the flight path. If the flight path is 18 degrees nose down, a steep dive, the aircraft will stall as the attitude approaches level flight. Less well understood is the importance of the relative wind acting on the wing. Relative wind is always opposite the direction of travel of the aircraft, so if an aircraft is descending in a level attitude, the AOA is greater than if the aircraft was in level flight. The diagram illustrates the position of the wing in various flight attitudes. Attitude is only indirectly related to angle of attack. The wing can be stalled when it is a near level position, above the horizon or below. Many pilots believe that an airplane won't stall until it reaches the stall speed (Vs) published in the POH. Stalls and spins both result from a disruption of airflow over the wing. It is important for all pilots to know that a stall or spin can occur at ANY airspeed and at any attitude. If the wing reaches its critical angle of attack, it will stall. A spin will result when one wing has a lower coefficient of lift than the other. A full explanation of relative wind, stalls and spins was carried in the February 1997 issue of AOPA Flight Training magazine. One safety device long available in airline and turbine corporate aircraft is an angle of attack indicator, which provides a real-time readout on the relationship between the chord line of the wing and the flight path of the aircraft. One type of an angle of attack indicator is shown here. Very few typical GA aircraft have such a device, so after passing the private pilot check ride, most pilots revert to an overly simplistic concept of stalls and spins. This view is best summarized in the words of flight instructors the world over: "Watch your airspeed, or you're going to stall this airplane!" Even after a gentle demonstration of an accelerated stall (reaching critical angle of attack in a steep turn at a higher airspeed than during level flight), the "watch your airspeed" myth persists. P - Retard the throttle to idle. In most aircraft, power hampers the recovery. A - Ailerons neutral. Many pilots will attempt to recover from the spin using the ailerons. This may actually make the problem worse. R - Apply full opposite rudder. Apply rudder opposite the rotation of the spin. If you have trouble determining which way the airplane is spinning, look at your turn coordinator or turn needle. It will indicate the direction of rotation. E - Apply forward elevator. Immediately after applying opposite rudder, apply a quick forward motion on the control yoke and hold anti-spin controls until the aircraft starts to recover. D - Recover from the dive. Once you have completed the four previous steps, and the rotation stops, recover from the dive. The descent rate may be over 5000 feet per minute and the airspeed will rapidly exceed redline. Remember to neutralize the rudder after the rotation stops. Do remember that since the majority of fatal stall/spin accidents occur at low altitudes, from which recovery is unlikely, prevention essential. Do practice stalls or approaches to stalls at an appropriate and safe altitude and only when you are competent. If it's been awhile, take an experienced CFI with you. Do practice spins only with an instructor who is current and only in a properly maintained and approved aircraft. In some cases a parachute may be required. Do fly at a safe altitude above the ground so that you won't be surprised by terrain, wires, or towers that would require a quick pull up and a probable stall. Do remember that turns, vertical (pull ups) or horizontal, load the wings and will increase the stall speed, sometimes dramatically. Don't explore the corners of the flight envelope close to the ground. Don't exceed 30 degrees of bank in the traffic pattern. Don't follow another aircraft in the pattern too closely. If you cannot maintain a safe airspeed (safe AOA) - go around. Don't buzz or otherwise show off with any aircraft. You don't need to - as a pilot you belong to a special group - less than one third of one percent of the U.S. adult population is certificated to fly.